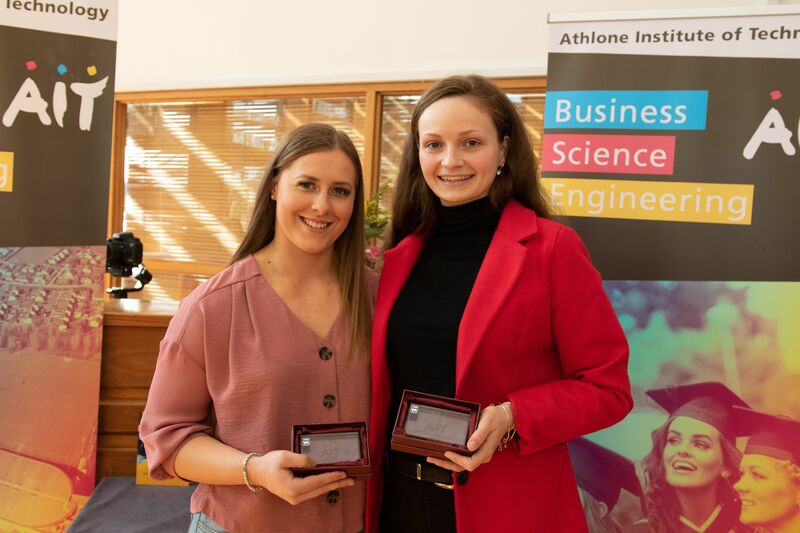 Athlone Institute of technology held its annual Scholarship of Excellence Awards last week, celebrating the outstanding academic achievement of eleven first-year students, each of whom achieved 500+ points in their Leaving Certificate examinations. To mark their achievement, recipients were awarded a bursary of €500 and a comprehensive gym membership, giving them access to the institute’s state-of-the-art facilities for the year. An educational powerhouse defined by a commitment to academic excellence, rigour and applied education, Athlone Institute of Technology has enjoyed considerable successes in the academic arena this year, most notably being named ‘best in class’ for research across the technological higher education sector. The institute is one of the top 25 colleges in the world for interdisciplinary research and the first Irish third level to receive the prestigious Academy of Pharmaceutical Sciences (APS) accreditation. Further solidifying its reputational prowess, Athlone Institute of Technology was awarded ‘Best Academic Partnership’ at the prestigious national Education Awards in Dublin last month for its part in developing SURE, Ireland’s first academic network dedicated to promoting undergraduate STEM research across the technological higher education sector. The conference affords young academics the opportunity to showcase their talent, not only to academia and the wider community, but to industry as it acts as a gateway for identifying and recruiting talent. The institute is also ranked number 1 for student satisfaction across the higher education landscape – encompassing both universities and institutes of technology. This student satisfaction rating comes off of the back of a nationwide analysis called the Irish Survey of Student Engagement (ISSE), which looks at nine aspects of the student experience. Athlone Institute of Technology’s continued success in the realm of student satisfaction is indicative of the quality of student experience on offer at the institute with 87% of its students rating their academic experience as excellent or exceptional. These accolades build upon the college’s success in winning the 2018 Sunday Times Good University Guide ‘Institute of Technology of the Year’ award for its unwavering commitment to academic excellence, innovations in applied learning and finely attuned ear to the needs of industry and enable it to attract high caliber students who will go on to live, work and raise families in the region. Andrea Teserova, BSc (Hons) in Software Design, St. Rynagh’s Community College, Banagher. Co Offaly. Ronan Farrell, BEng (Hons) in Mechanical and Polymer Engineering, Vocational School Ballymahon. Co Longford. Annamai Glennon, BSc (Hons) in General Nursing, Mean Scoil an Chlocher, Kilbeggan, Co Westmeath. Lauren Dolan, BSc (Hons) in Microbiology, Ard Scoil Mhuire, Mackney, Ballinasloe, Co Galway. Ciara Fitzpatrick, BSc (Hons) in Pharmaceutical Sciences, Colaiste Chiarain, Athlone, Co Westmeath. Niamh Fogarty, BSc (Hons) in Athletic and Rehabilitation Therapy, Droichead Chaislean Roiste, Mullingar, Co Westmeath. Ciara Whyte, BSc (Hons) in Athletic and Rehabilitation Therapy, Clochar na Trocaire, Ballina, Co Mayo. Justyna Twardoch, BSc (Hons) in Toxicology and Analytical Sciences, Community School, Carrick-on-Shannon, Co Leitrim. Kate Niami BSc (Hons) in Toxicology and Analytical Sciences, Moate Community School, Moate, Co Westmeath. Greta Norkute BB (Hons) in Business and Law, Mean Scoil Mhuire, Clochar na Trocaire, Co Longford. Catherine Harley BA (Hons) in Accounting, Schoil na Maighdine Muire, Clocher na Trocaire, Ballina, Co Mayo.